MONTGOMERY – June 2, 2011 – Rep. Wes Long, R-Guntersville, successfully fended off opponents on Tuesday, May 31, to shepherd product liability reform through the Alabama House of Representatives to final passage. The bill known as the Alabama Small Business Protection Act was part of a four-bill tort reform package, which the Alabama Civil Justice Reform Committee (ACJRC) and the Alabama Retail Association as a member of that coalition has sought since 1999. “Rep. Long is to be commended for passing a tort reform bill that will help protect jobs and foster future economic development in Alabama,” said Tom Dart, Chairman of the Alabama Civil Justice Reform Committee. Gov. 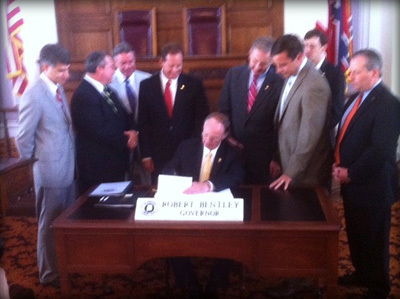 Robert Bentley is expected to sign the bill into law.